It’s official. I am devastated and in the grip of cooking magazine cold turkey. 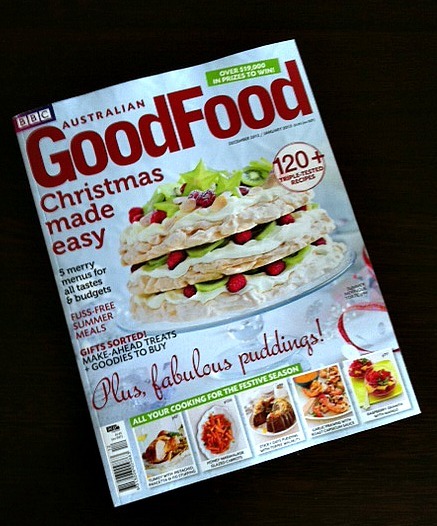 Australian BBC Good Food is no more and it’s the end of an era for my bookshelf and my kitchen. The last issue landed in my mailbox today. I know I still have the BBC Good Food website which is home to hundreds, if not thousands of recipes, but I’m still sad. There’s nothing like turning pages, salivating over colourful pictures and bookmarking recipes. I don’t know who could have made the misguided decision to cease publication, for this magazine is packed full of delicious and user-friendly recipes, interesting articles and kitchen wisdom. I must be one of a crowd of disappointed cooks all around Australia. Maybe you are one of them! Have you got a favourite magazine that you can’t live without? I’d love to hear about it!